It’s more serious than a case of when the cat’s away, the mice will play. Arguments over Igor Sechin’s appointment to run the country delayed the announcement of Dmitry Medvedev’s government for several weeks in May. Now that Sechin’s at Rosneft in charge of constructing the most powerful energy-producing and trading platform in the world, he hasn’t had the time to supervise the Russian mining and minerals sector, as he used to do during President Putin’s second term and his prime ministry. In allocating Sechin’s time cost-effectively, there’s no comparison between running Rosneft and sorting out the problems of Norilsk Nickel, Rusal, Urals Mining and Metals, and Metalloinvest. In September Sechin decided not to intervene when he was invited by Suleiman Kerimov and Mikhail Prokhorov to approve the consolidation of goldminers, Polymetal and Polyus Gold, and a state-funded buyout of the two oligarch shareholders. But a few weeks earlier, in mid-June, he had been keeping his eye on another precious metal mining company, a collection of depleting platinum assets called Russian Platinum, owned by Musa Bazhaev. The relationship between Sechin and Bazhaev goes back many years, starting first in the Khabarovsk region where Sechin protected Bazhaev’s refiner, Alliance Oil Company, and assured it of feedstock from Rosneft. In 2008 Sechin’s support of Bazhaev also helped persuade Mikhail Fridman and Alexei Kuzmichev, the Alfa Group shareholders bidding for the assets of Amur Artel, a fareastern gold and platinum miner, to give up their fight, and sell to Bazhaev. Out of that deal Bazhaev developed the ambition of challenging Norilsk Nickel as Russia’s platinum and palladium miner, and selling shares on the London Stock Exchange (LSE). He had little choice, as, having overpaid for Amur, and seeing its mineable metal dwindle, Bazhaev has been obliged to look westward to find new mineable deposits and assets to make his billion-dollar target valuation for Russian Platinum. These assets happen to be located in Norilsk Nickel’s backyard, and thus hard to get at if they are valuable; and not worth the shareholder interest if they aren’t. When Bazhaev and his newly named Russian Platinum vehicle did get hold of the Norilsk-1 mining licence on June 15 – after Norilsk Nickel had its earlier licence award of October 2011 annulled – Bazhaev needed the leg up from Sechin; and also from Alexander Popov, Sechin’s appointee in charge of Rosnedra, the federal mine licensing authority. Earlier Popov had been an assistant to Sechin; when Sechin left his government office in May, he put Popov in charge of Rosnedra. In less time than it took Sechin to snap his fingers, Popov had awarded the Norilsk-1 licence to Bazhaev’s Russian Platinum. That meant war with Norillsk Nickel and its control shareholder, Vladimir Potanin. Not counting vacation time in August, it has taken Potanin and his allies three months to defeat Popov, neutralize Sechin, and declare victory in the form of a government commission decision to cancel the second award of Norilsk-1 and put it up for sale for a third time. Instead of the closed-door assessment which Popov had managed at Rosnedra in favour of Russian Platinum in June, the new round will be an open auction in which the highest bidder wins. Unless Sechin intervenes again to provide more state bank borrowing capacity for Russian Platinum than can be marshalled by Norilsk Nickel, this is a contest likely to be won by Norilsk Nickel. 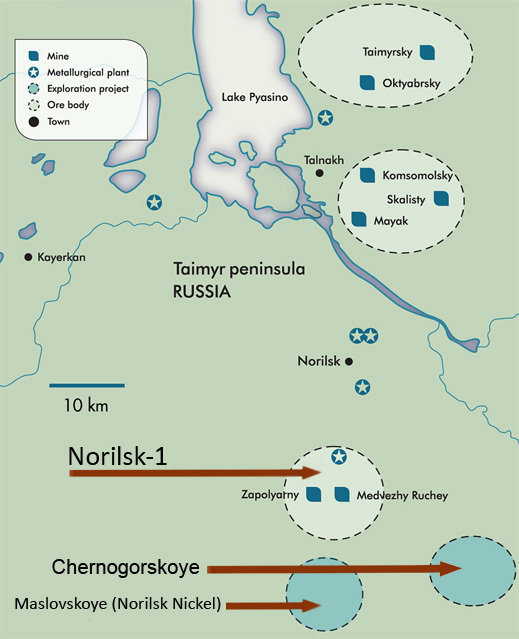 A source in the office of Deputy Prime Minister Arkady Dvorkovich confirms that he had ordered an independent expert committee of geologists to assess the the bid documents, and the respective merits and demerits of the two bids for Norilsk-1. Their report was then weighed by an inter-ministerial commission led by Sergei Donskoy, the new minister of natural resources. Dvorkovich is also in favour of an open auction to finalize the issue. Norilsk Nickel had gone to the government and to the courts to have the June 15 licence award revoked on the ground that Popov had rigged the outcome in violation of the licensing rules and the law on privatization of mineral assets. Donskoy recommended to the prime ministry to accept Norilsk Nickel’s arguments, and reopen the bidding for a third round. Rosnedra’s Popov and the Federal Antimonopoly Service (FAS) sided with Russian Platinum. But Dvorkovich’s spokesman now says the final decision by the government is against Russian Platinum. She also confirmed the accuracy of a report today in Kommersant elaborating on how this had happened. The Ministry of Natural Resources refused to respond to questions about Donskoy’s role or the outcome, referring instead to Rosnedra. There the press office requested a fax setting out the questions, and then declined to respond to them. On November 1, Russian Platinum issued a press release announcing it is getting under way with its new assets, Chernogorskoye and Norilsk-1. Chernogorskaya Mining Company, its mining subsidiary for the northwest, has signed a memorandum of understanding with Northern Shipping Company, for fleet deliveries of mining equipment and mine output between the White Sea port of Arkhangelsk and the Yenisei River port nearest the new deposits, Dudinka. Russian Platinum said it is estimating the inward cargoes rising in volume from 6 tonnes in 2013; 65,000 tonnes in 2014, and 146,000 tonnes each year from 2015 to 2017. Norilsk Nickel said it isn’t commenting on what has happened, or what will happen next in the bidding. A source close to the outcome confirms that the lobbying of government officials, and Sechin, isn’t over. For Dvorkovich to prevail over Sechin means that the latter must now decide whether to concede a major mining asset because he is too preoccupied elsewhere. And if that is what he is now ready to concede, what does this foretell for the much more acrimonious, higher value contest between Potanin and Oleg Deripaska?